Find a Pilates Exercise Program for You! There is a Pilates exercise program for everyone. Whether you are an athlete, man, woman, kid, older adult, pregnant woman, whatever you want to accomplish Pilates exercises can be tailored for your needs. The Older Adult – Older adults can prevent falls and improve their balance through Pilates posture and core challenging exercises. Exercises such as the dart done on the floor can help to improve upper back strength while working the core at the same time. 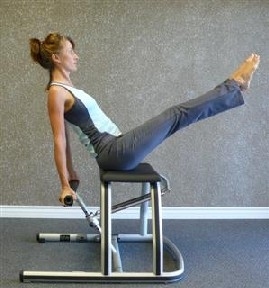 Pilates band exercises can also help with upper body and core strength through rowing type exercises. 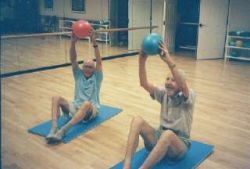 Many seniors experience an increase of energy, more restful sleep, and less aching joints when doing Pilates exercises. Isn’t it worth this much to at least give it a try? The Athlete – A Pilates exercise program can enhance the athletic performance for just about any sport. Pilates exercises can help to increase your speed and agility for racquet and ball sports. The coordination and focus you develop from practicing Pilates exercises from conscious and mindful movements contribute to better play. Pilates has helped to improve my balance, speed, and flexibility for bicycling. This contributes to less injury, faster recovery, and improved strength and speed. Women – Women, if you want to look younger, have more curves, feel more confident, walk taller, and turn heads when you walk into a room then you have to give Pilates a try! Remember, it’s not just for movie stars and the wealthy. Pilates is available to everyone and every size. Check out the The Newly Revised Pilates Ebook here to get started or try a class near you. Find out how Pilates can save your back! Men – A Pilates exercise program designed to increase flexibility and decrease back is a large contributing factor why Pilates is becoming more popular with men. It’s not just for looking lean and mean it does develop awesome strength and range of motion for sports like golf, tennis, and ball sports. Many professional golfers, basketball players, and yes, even football players are using it for conditioning and injury prevention. - Doing Pilates prior and during pregnancy can help to increase your core strength through deep pelvic floor exercises. These exercises can help through the birthing process and to decrease the low back pain you are feeling during your pregnancy. Pilates exercises help to improve your posture, in turn, decreasing the pain in your low back from carrying the extra weight. Weight Loss – A Pilates exercise program can help you to build lean muscle tissue decreasing the ratio of fat to muscle, thereby increasing your metabolism. Why is having more lean muscle tissue so important? Because the more muscle tone you have on your body the more fuel (fat/carbohydrates) you burn at rest and all the time. – Pilates is fun! Whether you are doing mat Pilates or on the equipment you are doing things you never felt possible and getting in shape. Kids love to be tested and asked to try something new. 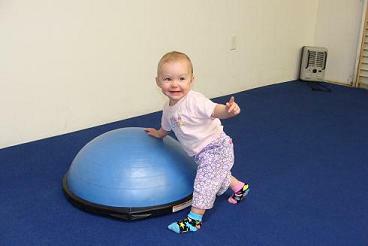 I love to do Pilates with my toddler and nieces. They look at me rolling around on the floor and call me crazy and then they proceed to do what I am doing. Before long we are laughing and having fun rolling like a ball, doing the swan dive, the mermaid, and especially the seal! Oh, and they love the names of all the crazy animals! Check out this article to find out the benefits for kids! Leave Pilates exercise program and find out more about how Pilates can benefit you!